A collection of ambient electronica that is seductive and immersive - if I can get away with such a description. It is territory that has been mapped out by Boards of Canada and Autechre’s recent Quaristice. Unlike the work of those artists, though, this album seems less concerned with digging into the darker, disquieting corners and beats of your unconscious than with drawing you into an imaginary 3-D world of organic, evocative flows and pulses. Cluster have been making music for nearly 40 years, they were amongst the pioneers of so-called Krautrock in the 70s, and have utilised all sorts of platforms, from traditional band formats to synthesisers and electronics, to explore the outer hinterland of musical expression and experimentation. This record is a worthy and generous 17-track addition to their oeuvre. 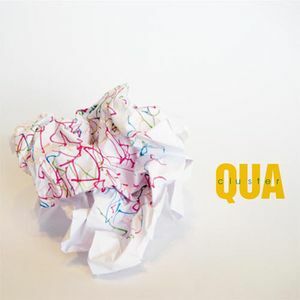 There is a form and a formlessness to Qua’s soundscapes; some tracks are fully gestated, crafted and structured orchestrations while others abstract, amorphous, truncated, more like fragments and bubbles of noise. Gissander blends and builds with percussion and instrumentation. Flutful scatters uplifting melody over disconcerting repetition. And Formatt holds back, minimal, floating absently. This album could be the soundtrack to a sci-fi film not yet made or long-lost. Cries in the lunar wilderness, static interference, distant clangs and creaking airlock-doors creep out over the rhythmic metallic taps, weird latin grooves and squelchy synth-lines. Highlights for me are the slow, driving, spacey ascent of No Ernel which suddenly comes across its destination and falls away in an instant, the jazzy futurism of Malturi Sa, and the self-conscious final track, Imtrerion, a mournful bedtime lullaby, an extended lament to close the album. Downtempo and cerebral, Qua captures those more introspective moments, assisted to perfection by the warmth and depth in the production which pulls you all the way in.